When I first saw the above sculpture by Italian artist Maurizio Savini, I thought, “What is that stuff? It kinda looks like Bazooka.” Ahem. Yes, well, that’s because it IS Bazooka. Or bubble gum, at any rate. 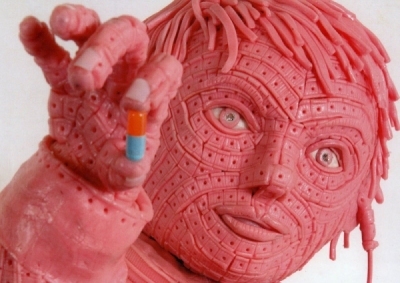 We’ve profiled a few gum artists before (and we even have a candy art category here), but none who work in 3D, or are quite as detailed as this. The artist is no one-trick pony, he’s actually a highly accomplished sculptor with a very long and impressive looking resume. Unfortunately I could not find much detailed information about the process he uses to create these works of art, nor about the reasons behind this choice of medium. Apparently most of what he produces is done using plexiglass forms – where he creates the form and then places the unchewed gum onto it to create the final piece. 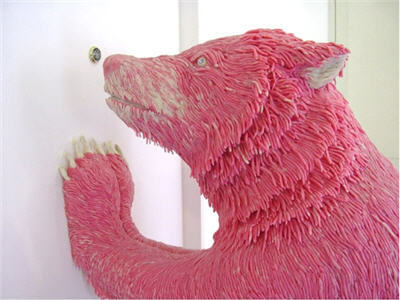 I did find several places online where you can view his work – there are quite a few of these gum pieces to look at. Some of the pieces are decidedly creepy – in particular I find his human forms a little bit disturbing. Others are political commentaries, and others are simpler forms like animals and shoes. Wow, talk about talent. I love how people’s minds are so out there sometimes. It’s like seeing the world in a different view from the norm. It’s beautiful.